Before Johnny Mize played a game for the Cardinals, they gave up on him and gave him away to the Reds. Fortunately for the Cardinals, the Reds gave him back. During six seasons as the Cardinals’ first baseman, Mize would win a National League batting title (.349 in 1939), a RBI crown (137 in 1940) and twice would lead the league in home runs (28 in 1939 and 43 in 1940). In three consecutive years (1938-40) with the Cardinals, Mize led the NL in slugging percentage and total bases. 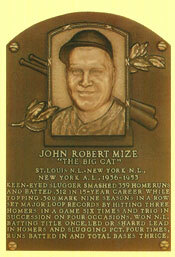 Nicknamed “The Big Cat,” Mize was a four-time all-star with St. Louis. He would be elected to the National Baseball Hall of Fame. The story of how Mize transformed into one of the Cardinals’ all-time sluggers is filled with a dizzying array of twists and turns. In 1934, Mize, 21, was with the Cardinals’ minor-league Rochester (N.Y.) affiliate. His season was cut short because of a groin injury. In 90 games, Mize hit .339 with 17 home runs. Larry MacPhail, the Reds’ brash general manager, needed sluggers for a team that ranked last in the major leagues in runs scored (590) in 1934. MacPhail saw Mize as a cornerstone for that rebuilding project. Jim Bottomley was the Reds’ first baseman. Bottomley, who would be elected to the Hall of Fame, had been a standout for the Cardinals, helping them win two World Series titles (1926 and 1931) and four pennants. The Cardinals traded him to the Reds in December 1932. Though he hit .284 with 31 doubles for the 1934 Reds, Bottomley, 34, had peaked as a run producer. Powel Crosley, the Cincinnati radio manufacturer and broadcasting titan, had purchased the Reds in 1934 and was willing to spend money to revive a franchise that had finished in last place in the NL that year. In December 1934, MacPhail approached the Cardinals and offered $55,000 for Mize. It was an astonishing sum at a time when the nation still was staggered by the economic hardships of the Great Depression. MacPhail’s offer topped the $50,000 the Yankees had paid the San Francisco Seals a month earlier for their highly touted prospect, outfielder Joe DiMaggio. The Cardinals, who had won the 1934 World Series championship, were quite willing to accept such a large sum for a hobbled player who never had appeared in the big leagues. On Dec. 13, 1934, the Cardinals sent Mize to the Reds. As spring training started in February 1935, Mize told reporters he was “entirely recovered” from the groin injury. The Sporting News speculated Bottomley would be traded to the Cubs or Giants. After watching Mize perform, though, it became evident something was wrong with him. It later was determined spurs had developed on his pelvic bone, restricting his movement and causing pain. On April 15, 1935, the Reds voided the deal, returning Mize to the Cardinals the day before the start of the season. Assigned to Rochester, Mize played in 65 games and hit .317 with 12 home runs until the pain became too intense to continue. With his career in jeopardy, Mize agreed to surgery after the season. The report was accurate. Mize opened the 1936 season with the Cardinals and soon after took over from Rip Collins as the everyday first baseman. The rookie hit .329 with a team-leading 19 home runs and 93 RBI for the 1936 Cardinals. In six seasons with St. Louis (1936-41), Mize batted .336 with 1,048 hits in 854 games. His .600 slugging percentage with the Cardinals ranks third all-time in franchise history and first among left-handed batters. The only players with higher career slugging percentages as Cardinals are Mark McGwire (.683) and Albert Pujols (.617). Mize also ranks fifth all-time among Cardinals in career on-base percentage. At .419, Mize is just below Pujols (.420) and just ahead of Stan Musial (.417). On Dec. 11, 1941, seven years after they sent him to the Reds, the Cardinals traded Mize to the Giants for catcher Ken O’Dea, first baseman Johnny McCarthy, pitcher Bill Lohrman and $50,000.